Start living intentionally. Reach your wildest goals. Make yourself proud. What Can A Vision Board Do For Me? You feel stuck (at your job, in a relationship, in your whole freakin' life), but you can't seem to find the strength to move forward. You can't stomach another freaking success story showing ordinary people just like you who are living their dreams - all while you seem to be living the same year over and over. That's where a vision board comes in. "I have done vision boards before and I don’t think I put much thought into them. I just cut out nice phrases and pictures from magazines and said I would figure out how to make them fit into my vision. The Vision Board Planner definitely made me change my modus operandi. This guide required me to be very intentional about what I put on my board. The activities made me focus on the areas of like I wanted to improve upon. They made me really sit and think about the things I wanted to achieve. I did not have to make the pictures/phrases fit my vision. Because of the background work I had done, gathering the items for the board was so much easier than what I was used to. Using the planner made creating my vision board so much more than a thing to do with friends. The board became my permission slip to dream. Thanks so much Chantl for creating the planner. 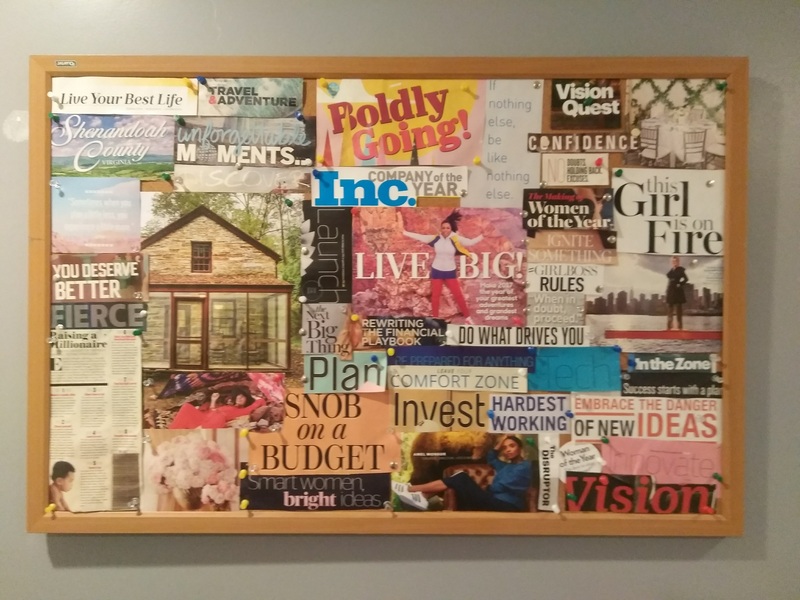 I would suggest it to anyone who is thinking about creating or revamping a vision board." To achieve your vision you have to define it. To reach any level of happiness, you have to define what you need to be happy. Most people know what they want, but struggle to say it out loud. Create a vision board that works to transform your life. create a miraculous future you can get super excited about! I'm unapologetically me. I'll tell you about the years I spent unemployed, juggling three jobs and struggling with depression, what life was like adulting as a single teen mom, or moving back in with my mother at twenty five (I was sharing a blow up mattress with my daughter because I couldn't even afford a real bed). #Truth. Then I'll tell you the story of how I gave up everything, apartment, car, and even my phone (gasp!) to turn my entire life around, land my dream job, triple my income and start an online community for women that want to transform their lives. My books and courses designed to accept you as you are and to help you on your journey to becoming the best version of yourself. I live in New Jersey with my sarcastic gamer/coder/aspiring-youtube-star daughter and MVP auntie. I spend my weekdays running million dollar marketing campaigns for a billion-dollar FinTech Startup. (My, have we come a long way!) I spend my free time writing on the Thrive Lounge blog, gaming with my daughter, brunching with friends and slowly pursuing my life-long dream to become a singer. "The vision board really helped a lot of our moms to look back at their goals and dreams in a very subtle but realistic way. They enjoyed the creative process of the activity wherein they are able to express their own concepts of change and steps without inhibition or fear of being judged. Therefore, on behalf of Bridges to Independence and my clients I would like to say thank you for spending your weekend with our moms. It has been a great fun time for all of them." 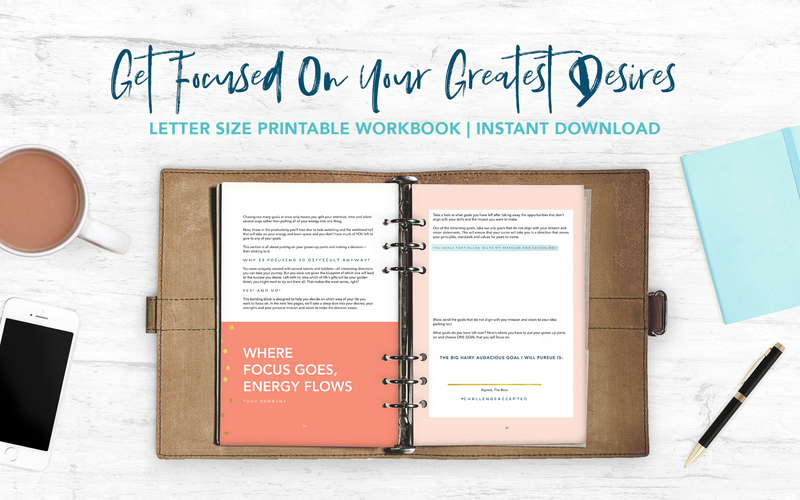 Unlock your wildest dreams and watch them come to life with your vision board. 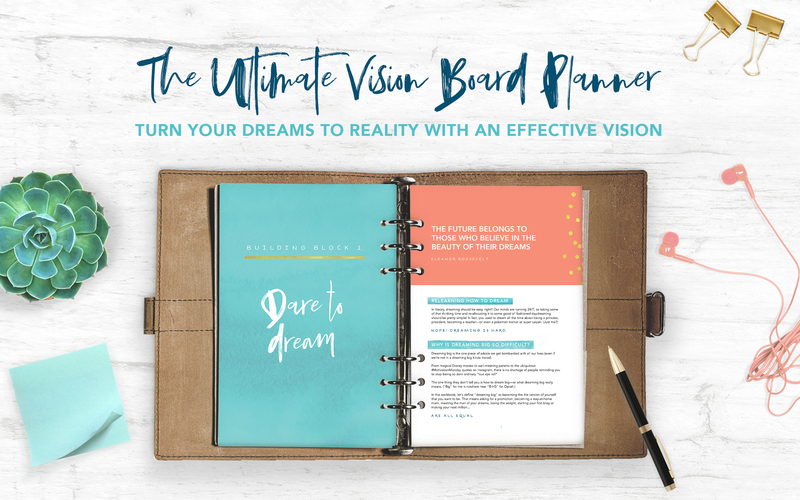 What's inside The Vision Board Planner? Explore Your Possibilities: Even if you don't know where to start in creating your vision, we'll walk through four key "building blocks" that will create a strong foundation to build your miraculous vision. 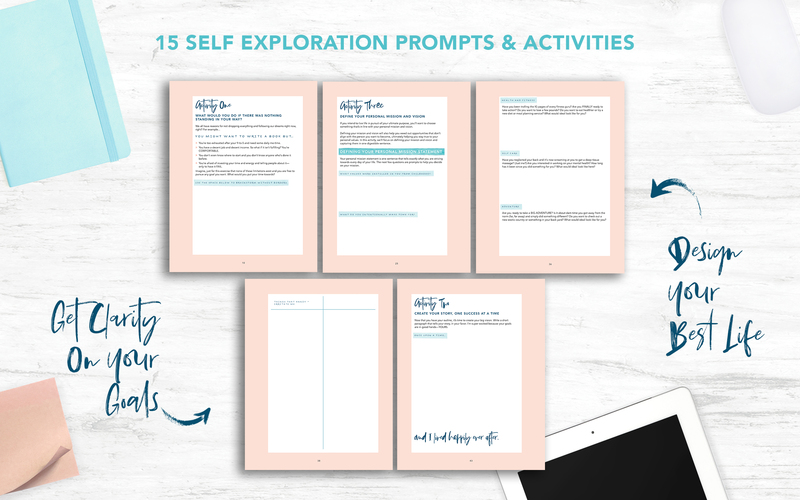 15 Interactive Activities + Prompts: One tiny step at a time, we'll take you from confusion to clarity. From exploring different opportunities to creating intentional goals based in your personal values and purpose, each activity elaborates on the one before it to help you set goals that matter. "Loved the vision board planner! I'm actually getting a group of girl friends together to have a vision board party. I've done my vision board and its already manifesting. Love your vision board program!" You've made the decision that come hell or high water you're making a huge change in your life. You've had this idea that's bugging THE CRAP out of you and you're wondering if NOW is the time to try it out. 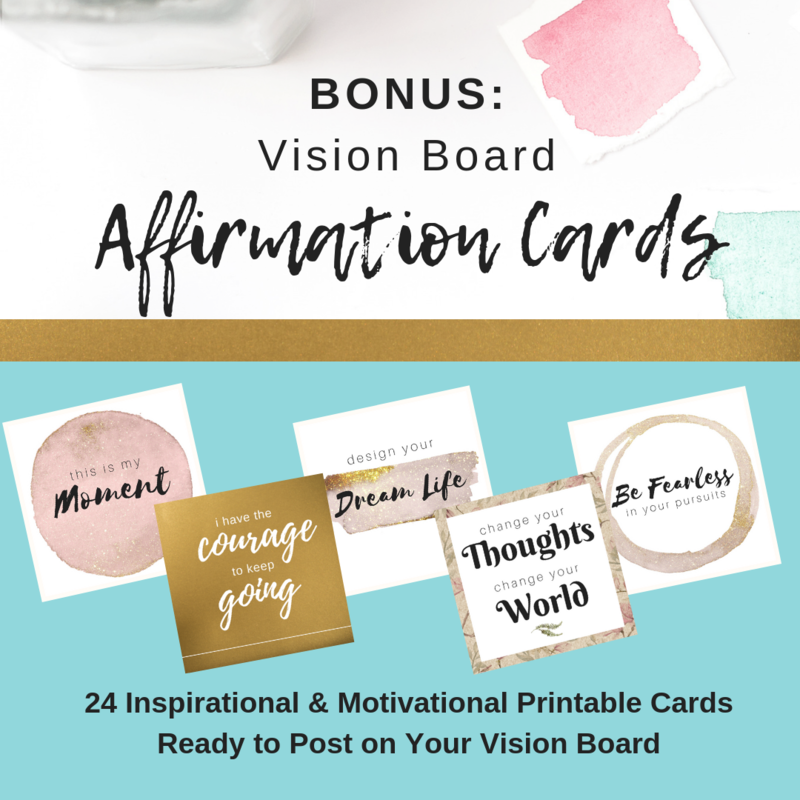 Get a pack of 24 Vision Board Affirmation Cards to get started on building your vision board right away. you can get one step closer to achieving your dreams.